The development of triple bottom line (TBL) life cycle data sets for building decision-makers is critical to overcome first-least-cost decision making patterns that prevent owners and tenants from investing in high performance, energy efficient building solutions. 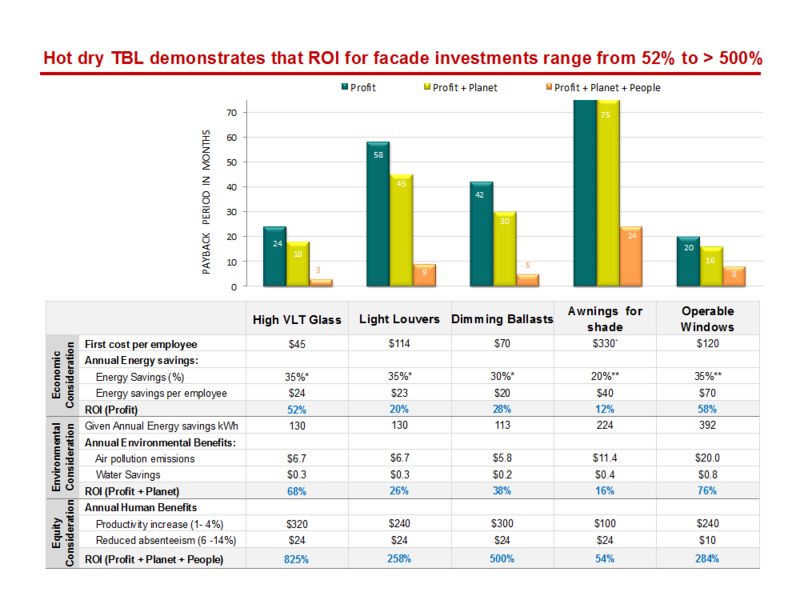 While the completion of five to fifteen year energy payback calculations (first bottom line) can prompt increased investments, the addition of environmental and human benefits (second and third bottom line) provides the ‘tipping point’ for the level of design, engineering and investment needed for high performance facades that save energy and improve the quality of the indoor environment for workers. With a focus on building investments in hot climates representative of India and large sections of the US, first and carrying cost-benefits, environmental cost-benefits and human cost-benefits are being developed. The second bottom line calculations capture environmental cost benefits that are directly linked to electric energy savings: reduction in CO2, SOx, NOx, particulates (PM) and water demands. These four pollutants are regulated and even taxed in leading countries to reduce global warming, respiratory illnesses, cancers and developmental impairment. The third bottom line calculations capture the human benefits that are linked to improved thermal, lighting and air quality drawn from the ongoing research of Carnegie Mellon’s CBPD towards linking the quality of the built environment to health and productivity outcomes. Given that lighting and space conditioning are 60% of office energy loads in India, arguments for investing in façades that optimize daylighting and shading, natural ventilation and mixed mode are critically needed. This research effort is developing triple bottom line quantifications for climate-responsive façade and related system improvements – e.g., high visible transmission/ low solar glass, internal light shelves/inverted blinds, daylight dimming, external overhangs/shades, and operable windows. The TBL cost optimization, including facilities cost savings, carbon credits, and human health and productivity benefits, demonstrate rapid paybacks that can influence decision makers to move beyond first-cost decision-making to support investments in high performance, energy efficient technologies, while creating market opportunities for US technologies and expertise. Triple bottom line framework utilized for exemplary investments and cost optimization of energy efficiency.